General Carlax is the most revered Lupin General to date. His forces in the last 3 eclipses, has defeated the Werewolf onslaught time and time again. In the last 20 winters, he has never lost a battle even when he had less men and less supplies. Often he finds solace in taking time after a fight to walk the battlefield and ask that Lycrayne grants mercy to his fallen enemies and comrades. His prowess as a soldier are just as impressive. 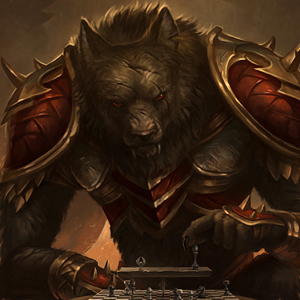 Carlax will sooner meet his enemy on the battlefield in mortal combat than just sit around talking strategy. During the Battle of Stonefang Cavern, when he was just a lieutenant, his battalion fell into a trap and Carlax carved a path through 15 Werewolves by himself before the rocks above him were hit by an explosive arrow that buried him beneath a ton of rubble. He was found underneath that rubble, brought back to the encampment, the entire time yelling that he “was ready to tear those filthy lycans to bits with his teeth”. He rested for a fort night and was back in the fray immediately.